My gluestick ran out and I'm feeling rather lost; I've been pasting things into my inspiration notebook all morning and my fingers are tacky. My 2006 resolutions (if you could call them that) are rather vague, but I was afraid of being too specific, of locking myself into something that I could never achieve. I suppose all you can do is try. the idea is to have a complete soundtrack with one song from each of my lj friends. i'll make a "friends list" mix cd (as I am addicted to mixes at the moment!) with a cover that includes all the details of which song belongs to who. If you would like to be immortalised forever in my friends list soundtrack/mix cd, here's what you do: pick out one-two songs you would like to represent you. Then comment & send it to me via yousendit or some such thing. You can send your all time favourite song, a new favourite, or just any song that you relate to & you feel describes you well. tis me! (who came up with the friend music thingey). hehe. i've been busy too you know, it wasn't an accusation. I like your resolutions. I have made one to read a book every month, not as good as your every-week one but I think when uni goes back I wouldn't be able to keep up that kind of pace! 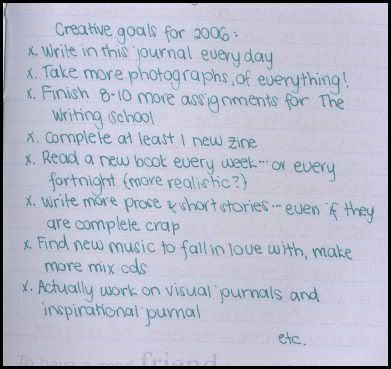 aw, your resolutions make me happy :) I definitely need to get more creative. I feel so much better when I am, but I get distracted and blahblahblah. i am going to make you a copy of a cd someone gave me. i think you might like her. email me your address? <3 adores your goals. I remember when I use to make mix cassettes all the time. Funny making mixes seemed to stop at the same time I got a cd burner. Not sure why. Anyway, I will need to have a little think. *is very determined to not pick Tori songs, as it would be so unoriginal that it would be beyond funny. by the way, did you get my christmas card? hehe, I'm SO sorry for taking so long, eeeeeek. I did get your Christmas card, thankyou somuch!! oh darling, goodness, i know you have had so much going on lately! btw, did you get my christmas card? But I am still keeping up with my written journal. I spent 30 min this morning cutting and pasting things into it. Therapy for me I guess. I hope your other goals are kept as well. Oh! I would love to read another issue of your zine. I hope that does happen! I am working on a new one...titled becoming undefined. Hope I get it out by March. i am glad you are still doing the journal anyway, after all, the community is more about keeping a journal, rather than posting to the lj community, if you get what i mean. For some reaons the phrase "My gluestick ran out and I'm feeling rather lost" struck me as incredibly amusing.